I’m just going to get right to the point here, Chick-fil-A is flippin’ delicious. There’s just something about how perfectly moist, juicy and seasoned their fried chicken sandwich is, that I just cannot control myself when I’m in there. That’s why I never go. :(. So I decided to scour the Internet and see if I could find a copycat version that was more Weight Watchers friendly. And after a few trials, errors and tweaks, I finally came up with the perfect version. You can save another Point or two by using a sandwich thin instead of a traditional bun, if you’d like. But this recipe is still a great bargain in comparison to the restaurant version. I’m sorry that I didn’t get a chance to dress up the sandwich more for the picture, but it smelled soon incredible, and my family and I were all dying to eat it! So, the photo shows just the bare bones. But I recommend serving it with some pickle slices, lettuce, tomatoes and onions. Get your Chick-fil-A craving satisfied with this amazing Weight Watchers friendly knock off recipe. 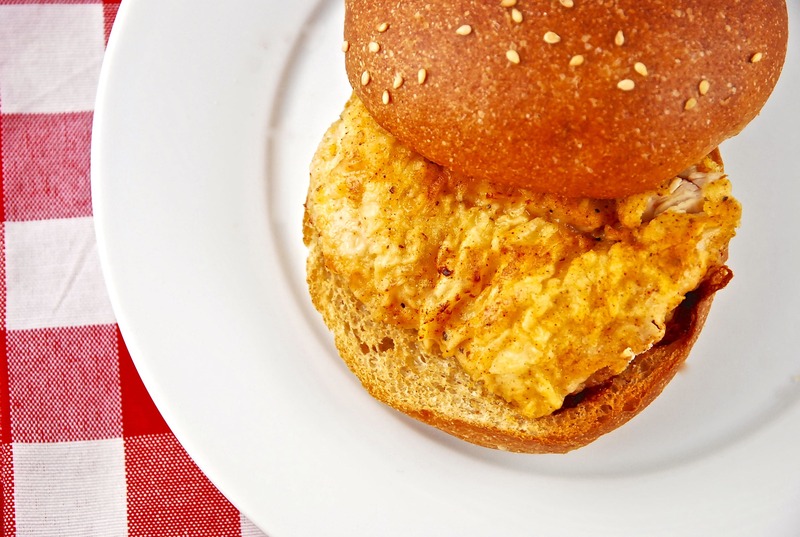 Tender, juicy chicken breast, with a light, crispy coating, served on a whole wheat bun. Using a meat tenderizer or mallet, pound chicken with the flat side until each fillet is bout 1/2” thick. Place chicken in a small bowl, and cover with the pickle juice. Cover and marinate for 2 hours. In a small bowl, whisk together the egg, egg white and milk. In a another small, shallow bowl, combine the flour, paprika, dry mustard, baking soda, and salt and pepper. Dip each chicken fillet in the egg mixture, gently shake off the excess, then coat evenly with the flour mixture. Heat oil in a large, nonstick skillet over medium high heat. Fry each chicken fillet for about 3-4 minutes on each side or until chicken is cooked through, and outside crust is golden and crisped. Serve on toasted whole wheat buns with desired toppings. These are so yummy! My family has requested these to be cooked again soon! Thank you! Good afternoon. First of, thank you for all you do and all your wonderful recipes to help us stay on track. I can’t wait to make this!! I just wanted to clarify 2 things. At the top of your post it says 7 points +, however at the bottom it says 8. Also, the calories are off as well. Thank you again. Thanks for catching my typos! I’ve corrected the post. :) The recipe is 7 Points +. Is the pickle marinate for flavor or to help the breading stick? We don’t care for pickles, so I’m wondering if I can/should omit that step? The pickle marinade is for flavor. It doesn’t make the sandwich taste like a pickle though. I know that may seem odd, but somehow it all works really well without tasting pickle-y. This looks delicious!! At the bottom of the recipe though it says 8pp. How many points in the bun you use? Would the chicken sandwich itself be 4pp? Thanks! The bun I used was 3 Points +.